Macau casino operator Galaxy Entertainment Group Ltd on Thursday reported revenue of HKD18.5 billion (US$2.36 billion) for the first quarter of 2018, up 32 percent from the prior-year period, supported by “record” mass-market gaming revenue and “strong” VIP revenue. The company reported what it said was “quarterly record” adjusted earnings before interest, taxation, depreciation and amortisation (EBITDA) of HKD4.3 billion, up 36 percent year-on-year. Judged quarter-on-quarter, adjusted EBITDA rose by 4 percent, the firm said in a filing. The company said it “played unlucky” during the first quarter, which it said decreased the firm’s quarterly adjusted EBITDA by approximately HKD98 million. “We are very pleased to report that we have experienced a positive start to 2018, with all-time record quarterly adjusted EBITDA. This represents our 9th consecutive quarter of EBITDA growth despite competitive new capacity being added to the [Macau] market,” Lui Che Woo, chairman and founder of Galaxy Entertainment, said in a statement accompanying the selected first-quarter numbers. In a note on Thursday, JP Morgan Securities Asia Ltd said Galaxy Entertainment’s EBITDA margin had “edged up to a record 23.3 percent”, versus 23.1 percent in fourth quarter 2017 and 22.6 percent in first quarter 2017. “This suggests cost savings are still under way, though it’s difficult to analyse accurately given changes in its disclosure,” wrote analysts DS Kim and Sean Zhuang, referring to the casino firm’s way of giving information about its results. Galaxy Entertainment’s total gaming revenue reached approximately HKD17.2 billion in the first quarter of 2018, up 31 percent from the prior-year period, the firm said. 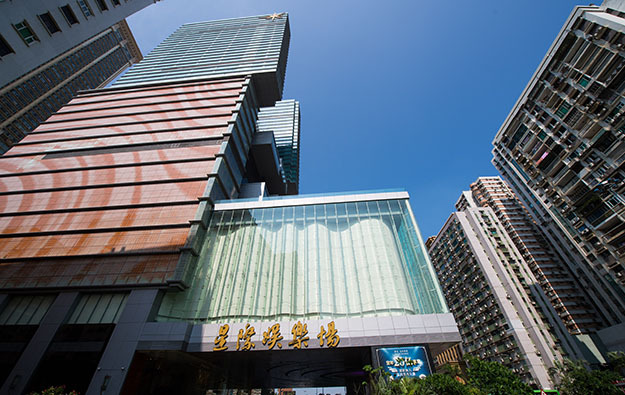 The casino operator saw its revenue from mass table games increase 17 percent year-on-year to HKD6.7 billion, while VIP revenue jumped 44 percent from a year earlier to HKD9.9 billion, with a win hold of 3.4 percent. The firm said that a modest volume increase in VIP turnover “was more than offset by not playing as lucky”. Galaxy Entertainment said its flagship property Galaxy Macau generated HKD13 billion in revenue in the three months to March 31, up 27 percent year-on-year. The property’s adjusted EBITDA rose 26 percent year-on-year to HKD3.3 billion. StarWorld Macau (pictured), on the Macau peninsula, reported first-quarter revenue of HKD4.5 billion, up 45 percent year-on-year. Adjusted EBITDA for the property rose by 55 percent year-on-year to HKD1 billion. Broadway Macau, which does not offer a VIP rolling chip programme, recorded revenue of HKD142 million in the first quarter of 2018, an increase of 5 percent from the prior-year period. The property recorded adjusted EBITDA of HKD13 million for the quarter ended March 31, compared to HKD6 million a year earlier. The casino operator said it had cash and liquid investments of HKD41.8 billion and net cash of HKD34.5 billion as of March 31, 2018. The company had debt of HKD7.3 billion at the end of the first quarter. “Our strong balance sheet combined with substantial cash flow from operations allows us to return capital to shareholders via dividends and to fund our development pipeline and international expansion plans,” said the casino firm. The group paid on April 27 a special dividend of HKD0.41 per share, a 58-percent increase compared to April 2017. Galaxy Entertainment’s expansion plans include the long-expected Phase 3 and Phase 4 of Galaxy Macau. The new phases will include gaming, 4,500 hotel rooms, convention and exhibition space, and a 16,000-seat arena. The company said it continues to explore opportunities in overseas markets, including Japan and the Philippines. Galaxy Entertainment announced in December an up to US$500-million investment for the holiday island of Boracay, in the Philippines, in partnership with Leisure and Resorts World Corp. In Thursday’s filing, the Hong Kong-listed firm said it intends to build a “premium quality, eco-friendly, low density, low rise resort that would include a small casino with up to only 60 tables”. The project however has been put in doubt as President Rodrigo Duterte has said he was not in favour of developing a casino on Boracay. The Philippine government meanwhile announced that Boracay will be closed to tourists for six months starting from April 26. The shutdown is referred to as an environmental clean up initiative. “We support the Philippine government’s decision to temporarily close Boracay and their restoration initiative for the island,” said Galaxy Entertainment in its Thursday filing. “We continue to work with our local partner to seek further clarification,” it added. Galaxy Entertainment said additionally that it will “actively pursue” the development of a casino resort in Japan with its partner Société des Bains de Mer et du Cercle des Étrangers à Monaco, also known as SBM. Galaxy Entertainment last month announced the hiring of Ted Chan Ying Tat as chief operating officer of its “Japan development team”. “We are encouraged by the recent tabling of the IR Implementation Bill with the Diet [parliament] and we look forward to the outcome of the Diet debate,” said the casino operator in Thursday’s filing.